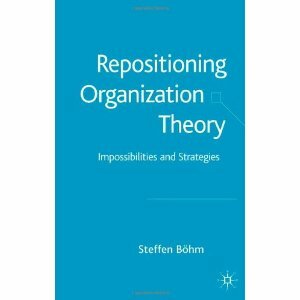 Positioning has had a bad press in organization theory in recent times. A position is often regarded as something negative because it involves fixing, placing and locating. In short, taking a position is seen as something limiting. In today’s so called postmodern times, a position is there not to be affirmed but deconstructed, dislocated, displaced and dismantled. Positioning is seen as an inherently modern event, and the purpose of the postmodern project, it seems, is to question and go beyond any type of positions that have come to be taken for granted. The ‘post’ in postmodernism signifies a movement away from the established truths of the modern era – a movement that questions any truths and eras. In fact, movement often seems to be all there is today: organization is seen as a verb rather than a noun; organization is a process that continuously emerges, it is said. In contrast, those who take positions have found it difficult to defend themselves against the growing dominance of this world of movement. This book is about recovering the discourse of positioning and highlighting the necessity for taking position.